These adjustable shooting targets define the most dangerous scoring areas (upper and lower V's). Used individually or with the team they are excellent for refining free kicks. 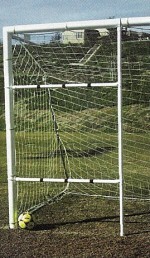 Targets fit both 7' and 8' goals. Fasteners are adjustable to fit up to 4" diameter goals. Lateral bars feature high contrast markings at 12", 24", and 36" to help shooter measure nearness to post. At 7'H, the maximum target size is 26"H x 49"W. Targets are constructed of high impact PVC tubing with steel brackets, are easy to set up/ take down, and come with a carrying bag. Ships UPS (OS1).